What Does Sushi Taste Like? A Complete Answer Will Be Revealed! 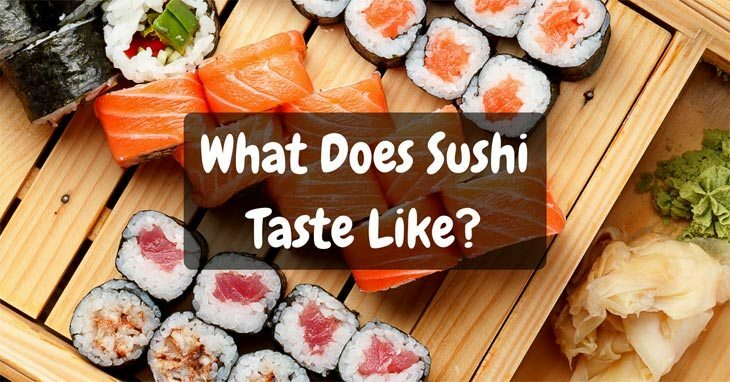 Are You Curious: What Does Sushi Taste Like? Trying sushi for the first time may not be so tempting, but it’s delicious and quite pleasing once you indulge yourself in its tangy flavors. Wasabi adds a spicy flavor to the dish, while sugar adds a dash of sweetness and balance the taste of the dish. Sushi is also served with soy to add a hit of tanginess in the complete dish. Are Sushi and Sashimi Same? No, sushi is not just a FISH wrapped in seaweed! It’s a Japanese dish that contains mild sweetness of Japanese sticky rice combined with seaweed that is dressed with sugar, salt and vinegar. You can combine sushi with raw fish like tuna, salmon, eel and can even cook it with salmon, shrimp, egg and crab meat. 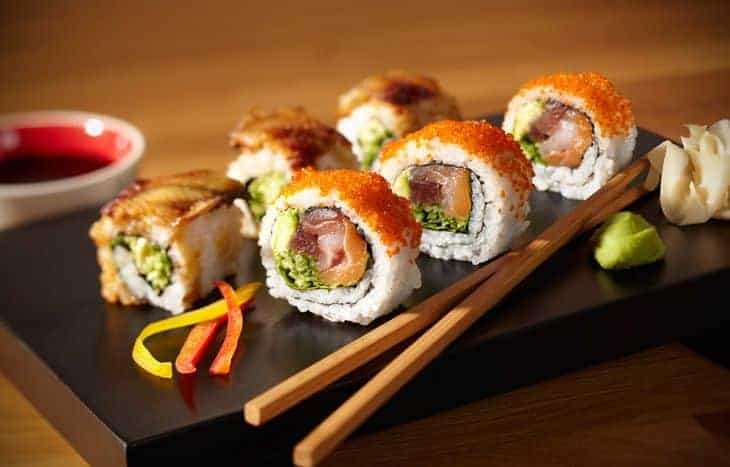 Sushi is a combination of different tempting yet natural flavors and textures. However, you can drizzle the topping that you love. 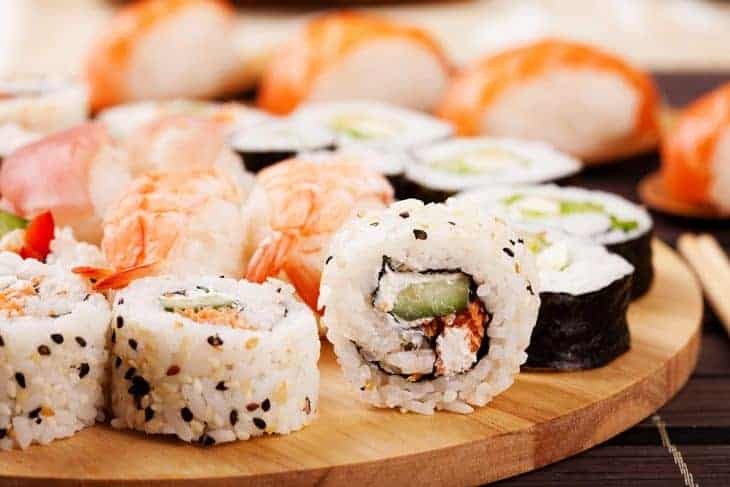 The traditional sushi is made from sprinkling vinegar over rice which is usually called as Sushi or sumeshi with the dressings of seafood, veggies and fish. The roll of rice, cucumber, fruit slices and fish, maki roll make a perfect dish to please the taste buds. It’s pleasing and tempting enough to make your mouth watering. Wrapped in the nori- a seaweed sheet with a thin film of omelets and soy paper, you will get to taste it with makisu or bamboo mat. Unlike rolled one, it is usually of cone-shaped and is a bit longer than other sushi’s. Although it features same ingredients as that of Makizushi, it is more than nori from outside. Also, no bamboo sticks are required to munch them; you can have it with fingers. It’s hand-designed sushi featuring the thin slab of sliced fish with the topping of rice. You can use any fish topping be it fresh tuna, shrimp, eel or shrimp, or even octopus. Moreover, the fish can be raw as well as grilled, fried or mild cooked. However, many renounced restaurants use highest quality fish; if you are cooking at home, you can use any fish. The main attraction of this sushi is its topping. The soy, veggies or strip of toasted seaweed is even used in the dish. This is quite popular among markets and Japanese groceries. It’s like a rice ball filled with veggies like mushrooms, carrots. The dish is then served in pouches made from tofu skin. If you don’t like raw tasting fish, this one is a perfect dish to try on. Also called as scattered sushi, it tastes like a burrito dish with the filling of all sushi ingredients. If you have any leftover in the kitchen, you can use it to make this dish. It’s also the first choice of vegetarians and doesn’t contain any fish. Depending on the type of fish and the flavors you use, sushi can have a variety of flavors. While some are made from tuna, some dishes are made from ell, shrimp, tofu or even salmon fish. All sushi usually have mild and subtle flavors drizzled with soy or any other source. The rice in the dish is what makes it more pleasing. The tangy vinegar taste with a bit of salt and sugar makes it taste delicious and different. 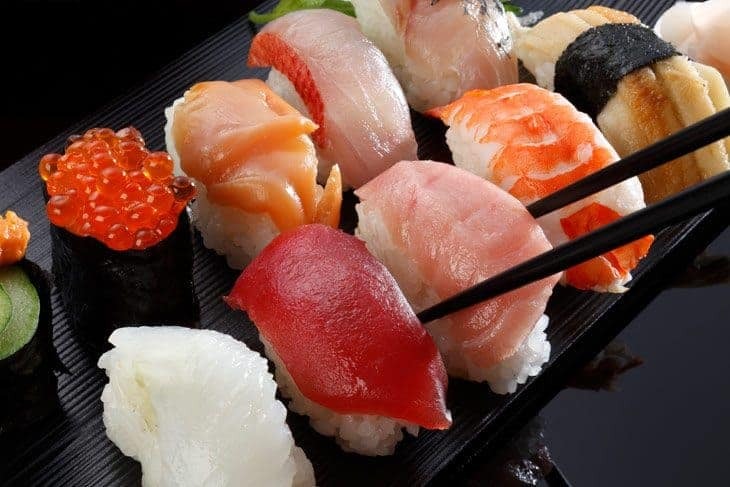 Moreover, sushi’s texture also plays an important role. It makes the complete dish look pleasing, while you can use octopus for hard textures, salmon and tuna are for beginners, ell tastes like chicken. 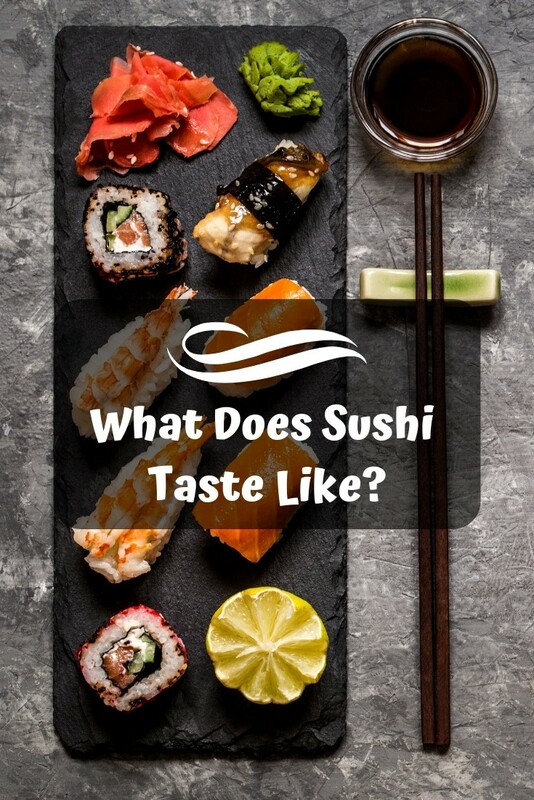 What does #sushi taste like? A complete answer will be revealed! Rice has a huge impact on the whole dish, and they are mostly overlooked. To have perfect flavors on the platter, rice should not be overly cooked. Plus, they should have perfect vinegared, failing which, the quality of the dish will lag, and you perhaps get a not delicious taste. There are many best teppanyaki grills you can use at home to prepare sushi with soothing flavors and pleasing taste. Besides, the quality of rice used, the temperature of cooking and the preparation method also matters to get the perfect dish on the plate. Many sushi restaurants have their style of preparing; however, the basic and traditional concept matters a lot. Plus, they make a huge impact on the taste and the appeal of the dish. People mostly think of sushi as a dish rolled in the fish. However, it’s more than that! The futomaki rolls: They are usually large; at least about 2-inches and contain two or more than two ingredients. Hosomaki: Slice them thin at about 2.5 centimeters and cook them. It only contains one ingredient and mild flavors. Ehomaki Rolls: It has seven ingredients and is one of the most popular sushi. Some of the ingredients include ell shiitake mushrooms, egg, and a small shaving of gourd called as kanpyo. Temaki: This is usually cone-shaped with s good stuffing of many ingredients. Sushi is served with rice while Sashimi is served with the slices of fish. So, both have different flavors, and both possess different taste. However, both are Japanese most popular dishes. 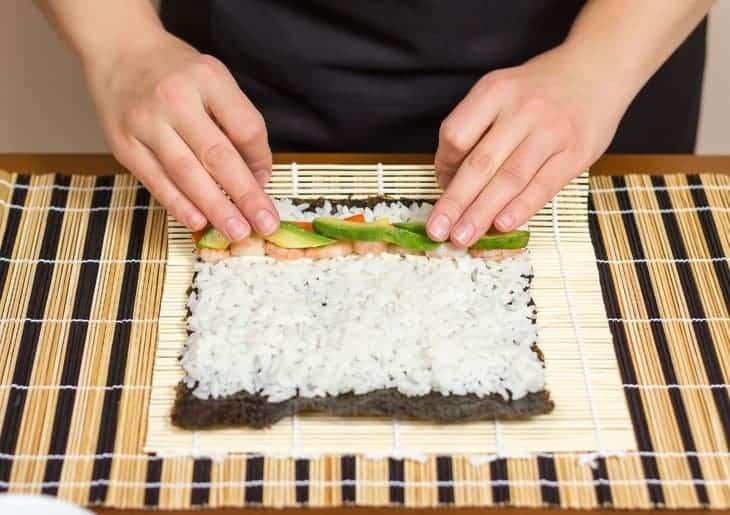 Well, there’s no rulebook stating how to eat sushi, but the traditional way of eating is with your hands. Hold the sushi between your thumb and middle and place it in your mouth. Let your fingers feel the texture which you won’t feel with chopsticks. Also, don’t dip the dish in soy sauce, the rice will absorb all the soy changing the mild flavors of the dish. Sushi tastes best when it’s served with subtle flavors and minimum seasoning. Pro Tip: Place the sushi in the upside down shape so that the fish will be against your tongue. So much so, savor your taste buds with the delightful sushi experience!